Baby blue eyes are beautifully breathtaking, but I’am not talking about the eyes of a newborn child. 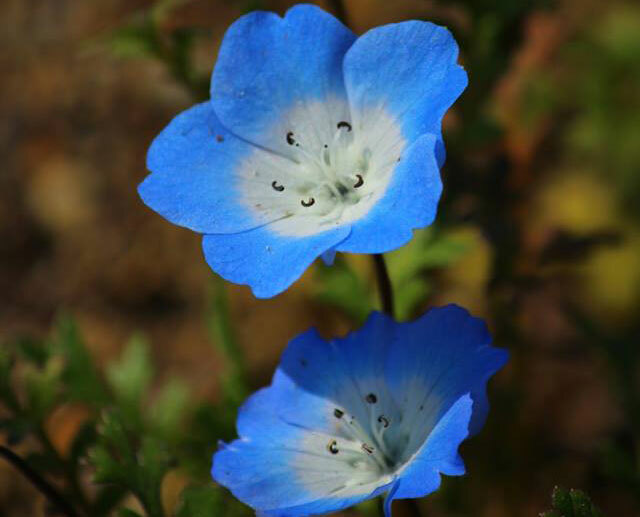 Baby blue eyes, which are also known as nemophila menziesii, are soft white and blue wildflowers that originate in the Baja area of California. It has a very low to the ground spread that will look great in a flower garden, a rock garden, or even as a border along your garden pathway. When the spread is wide enough, it will add an absolutely beautiful array of color to your garden, but the trick is knowing how to care for the baby blue eyes properly. Let’s take a look at some growing tips to help you create a beautiful spread of baby blue eyes. 1. The best way to begin growing a baby blue eye plant is to start it from a seed. It is a plant that grows best in warmer temperatures, so do not attempt to germinate the seeds until the temperature remains about 68 degrees Fahrenheit. 2. Disturbing the roots of an adult baby blue eye plant can cause the roots of the plant distress, so if you are transplanting an adult plant, make sure to take additional care of the roots. Many times transplanting a baby blue eye plant can cause it to perish, but if you do end up losing your plant, it can easily be grown back from a seed in time. 3. The plant loves sunlight, but full sun often wilts the leaves, so partial sun is the best option to ensure that the plant is healthy so that it can properly grow. If your sunlight is limited, try a location that has a lot of afternoon shade because that is the time when the sun is the hottest and the leaves of the plant can become scorched. 4. Baby blue eyes tend to do best in enriched soil that is made from a combination of compost and sandy soil. The plant will not have any issues growing in most types of soil, but they need to be well-drained soil that will not hold water at the roots. 5. Fertilizer is rarely needed to improve the growth of this plant, but it can be a useful additive that will only help the plant to grow more. 6. When you first plant a baby blue eye, make sure that the plant is watered quite a bit, but also make sure that you add the water to the container or garden gently so that the seeds that you are attempting to germinate do not wash away. 7. These wildflowers do not require a lot of water to grow; in fact, they are accustomed to living in an area where droughts are common. Make sure that the top of the soil is dry to the touch before giving the plant additional water. Baby blue eyes are not cactus plants however, so make sure that you do give them water before the soil is completely dry because a lack of water could stunt the growth of the plant or even kill it. 8. A seed that you are attempting to grow should be planted in the ground 1/16th of an inch below the surface of the soil. With enough cool air, water, and sun, the plant should germinate in approximately seven to ten days. 9. If you are looking for a thicker spread of these wildflowers, you can pinch the tips of the plant. Once the blooming period begins, cut off the heads of the plant, dry them out in a brown paper bag, and you will have a good bit of seeds to plant next spring. 10. Aphids can be an issue with these plants, so to make sure that the little insects are not harming your plants, you can use a garden hose to remedy the situation. You can also create a soapy mixture if the water alone does not do the trick. Planting baby blue eyes in your garden will require a bit of effort, but if you follow these tips, you will have an amazing ground spread in no time.